Full name CARLOS SANTANA...Wife, Brittany...Son, Carlos David (8) and daughter, Savian Jazmin (3) and Luna Star (1)...Signed by the Dodgers to his first contract in August of 2004...Worked on the KeyBank Glove Drive and Kids Run the Bases in 2011...Favorite athlete growing up was Adrian Beltre, favorite team was the Tampa Bay Rays and calls Minneapolis his favorite road city...Enjoys spending time with this family in the off-season...Regular participant of TribeFest and canceled a previous engagement to attend the 2019 event...Toured Japan with the MLB All-Star Team in 2014...He and his wife are frequent visitors to the Providence House during the season, the nation's oldest Crisis Nursery, committed to child abuse prevention and family preservation. Spent first season in Philadelphia after signing three-year contract as free agent in December...Among all NL players, ranked second in walks (110), tied-sixth in games (career-high 161) & sac flies (8)...His 110 walks were the most by a Phillies switch hitter in a season in franchise history (surpassed Pete Rose's previous mark of 95 in 1979)...Became the 16th different Phillie to collect 100 walks in a season and the first to do so since 2008 (Pat Burrell, 102)...Was one of two players in MLB with at least 85 RBI and 110 walks (also: Bryce Harper)...Set a career-high with 161 games (141 starts at 1st base & 16 at 3rd base)...Stole home on April 4 at NYM...Became the first Phillie to steal home since Andres Blanco on 5/25/16 at DET...In the 4th inning on April 7 vs MIA, notched his 1,000th career hit on a 3-run HR (off Jacob Turner)...Slugged an XBH in seven straight games, May 4-10, the longest such streak by a Phillie since 2009 (Ryan Howard, 5/27-6/3)...Had 13 RBI in the four-game series vs SF, May 7-10, tying the franchise record for most RBI in a series of any length...His 22 RBI in May were his most in a single calendar month...Walked in a career-high eight consecutive games from 6/24-7/1...His 28 June walks were the most by a Phillie in the month of June since 1980, when Greg Luzinski had 28 (and a career high)…His 28 walks were the most by a Phillie in a calendar month since September 2006, when Ryan Howard had 35...His 74 walks were the most by a switch-hitter before the AllStar break since 2004, when HOU's Lance Berkman had 75 walks...Reached base safely in a season-high 20 consecutive games, 8/24-9/15, posting a .368 OBP in that span...Posted an 11-game hitting streak from 8/28-9/9, which tied for the longest by a Phillie in 2018...Following the season, played for the MLB All-Stars in the Japan All-Star Series. Ranked 3rd in the AL in BB/SO (0.94), 4th in walks (88), T-7th in times on base (242), 8th in PA/BB (7.58), 9th in pitches faced (2,648) and T-10th in intentional walks (6)... Led all ML switch-hitters in walks... Established a career high in runs (90)... Played for Dominican Republic in World Baseball Classic... Was named Wilson Defensive Player of the Year among all ML first basemen and was a finalist for the AL Gold Glove Award... Committed 5 errors in 1,155 total chances (.996 fielding %)... Made 153 starts: 139 at 1st base, 7 in RF and 7 as DH... Hit his 6th career leadoff HR, 4/4 at TEX (Martin Perez)... Played in his 1,000th career game, 5/16 vs TB... Homered from both sides of the plate twice: 7/24 vs CIN and 8/15 at MIN... Reached base 5 times and scored 2 runs, 7/29 at CWS (1-1, 4 BB)... CLE went 54-18 (.750) when he drew a walk and 57-12 (.826) when he scored a run... Started all 5 ALDS games vs NYY, reaching base safely in 4 of the 5 contests... Homered in Game 4 at NYY (Luis Severino). Enjoyed a career season from an offensive standpoint, primarily at the designated hitter spot, collecting single-season career bests in home runs, extra base hits, total bases, RBI, hits, OPS and runs on his way to again setting the club single-season homer mark by a switch-hitter (also owns career club mark with 151)…Finished tied for the club lead with 34 home runs and finished among American League leaders in a host of categories (at right)... Is now 9th in franchise history in walks (638) and T-12th in homers (151) with Joe Carter...His 34 HR were the most by an Major League switch hitter since Mark Teixeira hit 39 for the Yankees in 2011…Now ranks T12th in club history in home runs (151) with Joe Carter's 151 and became the 13th player in franchise history to eclipse 150 home runs, hitting #150 on Sept. 20 vs. Kansas City (Volquez)...Primarily batted lead-off and in the 5-hole all season, for the season batting .260 (85-327) with 18 2B, 19 HR and 41 RBI in 85 starts in the lead-off spot (67BB, .385 OB pct. )…Indians were 53-32 (.624) in those starts…His .385 lead-off on-base pct. was 3rd-highest in the American League behind Dustin Pedroia and Jose Altuve...Hit five home runs to start of contests, tied for the second highest single-season club total behind Grady Sizemore's seven in 2008…Homered in his first career plate appearance in the one-spot on April 22 at Detroit (last lead-off HR, Aug. 11 vs. LAA)...Made 92 starts at the designated hitter spot and made 62 starts (64 games) at first base for Terry Francona…The durable Santana had a streak of 131 consecutive games played end on April 29 at Philadelphia (was on deck as game ended) as he appeared in 150+ games for the fifth time in the last six seasons (tied for team-high with 158 games)...His 20 home runs at the All-Star Break were the most since Grady Sizemore in 2008…Enjoyed his 6th and 7th two-home run games on May 19 at Cincinnati and June 12 at the LA Angels…Notched a career-high 14-game hitting streak from June 30-July 17…Hit his fourth career "walk-off" home run on June 17 vs. Chicago-AL (Nate Jones)…From Sept. 6 thru the end of the season he batted .355 (33-93) with 17 runs, 9 2B, 2 3B, 6 HR and 19 RBI in 25 games to conclude the season and reached base safely in 24 straight games via hit or walk from August 30-Sept. 23...From 9/16-on he batted .411 (23-56) with 7 2B, 2 3B, 3HR, 13 RBI over his last 15 games....Named A.L. co-player of the week, Sept. 19-25 (Justin Upton)...Doubled and tripled in consecutive games, Sept. 30-Oct. 1 at KC, the 4th time an Indian has done so since 1913 and the first since Odell Hale in July 1936...Led the team in OPS (.865) and collected an OPS above .821 in each calendar month from June-on…Hit .327 (34-104) in Sept/Oct with 20 R, 9 2B, 6 HR & 21 RBI (1.079 OPS) in 29 games…His 52 extra-base hits out of 102 total hits vs. right-handed pitched (51%) ranked 13th in MLB…From August 17 thru the end of the season collected 37 walks in the season's final 44 games (ranked in the top 10 in the A.L. in walks for the sixth straight season)…Hit .265 (60-226) with runners on base and was 2-for-16 (.125) with the bases loaded...Only player since 1901 to collect exactly 99 walks and 99 strikeouts in a single season...Hit .192 (10-52) in the Postseason with a 2B, 3 HR & 4 RBI in all 15 games, starting 11 games at DH, 2 at first base and started the first two games of his Major League career in left field in Wrigley in Games 3 and 5 of the World Series. Enjoyed another consistent offensive season, anchoring the clean-up spot in the batting order for most of the campaign, spending most of his time at first base and designated hitter...Finished 2nd in the American League in walks (108), marking the fifth consecutive season since 2011 he has finished in the top-5 in the American League in base on balls (is 2nd in walks in MLB in that span to Joey Votto with 502)... Also finished 20th in the A.L. in on-base pct. (.357), T19th in RBI (career-high equaling 85), 12th in times on base (238) and 2nd in pitches per plate appearances (4.30)...Led the club in RBI with 85 and was tied for 12th in the A.L. in RBI after the All-Star break with 45...Made 132 starts at first base and 21 starts at designated hitter...Also made 89 starts in the clean-up spot, hitting .240 (76-for-317) with 14 2B, one 3B, 10 HR & 54 RBI (.762 OPS)...Also made 30 starts in the two-spot, 3 starts batting third, 30 starts batting fifth and one batting 7th...Reached base safely in 100 of his 153 starts via hit or walk...Played the last 112 games of the season from May 31-Oct. 4, the 4th-longest active streak of consecutive games in MLB at present... Passed Carlos Baerga on June 13 at Detroit with his 105th career homer, the most by a switch-hitter in club history (now owns 117 in career)...Enjoyed his second career grand slam on Sept. 18 vs. Chicago-AL (Sale) and collected his second career 4-walk game on May 13 vs. St. Louis (also reached 5 times, 2 1B, 3 BB on May 3 vs. Toronto)...Over his last 41 games from August 21 thru the end of the season he hit .245 (36-for-147) with 18 runs, 8 2B, one 3B, 6 HR & 30 RBI (29 walks)...Drove in 38 runs over his last 54 games from August 7 thru the end of the season...Had two 4-RBI games and six 3-RBI games...On the year he batted .233 (67-for-287) with men on base and .261 (46-for-176) with RISP...His season-high 11-game hitting streak from August 23-Sept. 4 was the second longest of his career...Was 5th on the club with 11 steals, a new career-high...Stole the same amount of bases as Los Angeles-AL's Mike Trout and Pittsburgh's Andrew McCutchen...Tallied more swipes than Detroit's Ian Kinsler (10) and Boston's Xander Bogaerts (10)...Since 2011, Santana leads the Indians with 399 RBI, 13th-most in the American League...finished with a club-high 32, 2-out RBI, T17th in the A.L...Hit .268 (51-for-190) against left-handed pitchers with 4 HR, 24 RBI, 35BB and 36SO (.382OBP, .755OPS)...in Cleveland victories, Santana hit .278 (77-for-277), tallying 64 of his 85 RBI this season in wins...Ranked among team leaders in 2015 in the following categories: RBI (85, 1st), games played (154, 1st), hits (127, 3rd), doubles (29, 3rd), home runs (19, 1st), walks (108, 1st), OBP (.357, 3rd), extra-base hits (50, 3rd) and total bases (217, 3rd). Enjoyed another consistent offensive season, anchoring the clean-up spot in the batting order while settling in at first base over the second half of the season...Set single-season club records for walks (113) and tied his own club mark in home runs (27) by a switch-hitter, becoming the first Indian to lead MLB in walks since Jack Graney in 1919...Also finished 12th in the American League in home runs, 11th in on-base p ct (.365), 16th in OPS (.792), 10th in times on base (241) and 3rd in pitches seen per plate appearance (4.30). He leads all Major League batters in walks (394) over the last four seasons since 2011 (first switch-hitter to lead MLB in walks since Tony Phillips in 1993) ... Santana also became the 5th switch-hitter in Indians history with at least 3 years with 50+ extra base hits (Cabrera, Baerga, Martinez , Alomar)...Also set a new career-high with 85 RBI (18th-most in the A.L. )...His 113 walks were the 6th-highest single-season total in franchise history and most by any player in club history not named Jim Thome. Season got off to a slow start, hitting .157 (14-89, .610 OPS, 9RBI) in Ap ril and .169 (14-83, .668 OPS, 8 RBI) in May as his average dip p ed to .146 thru May 21...From May 22 thru the end of the season (106 games) he batted .268 (101-377) with 20 doubles, 22 home runs, 72 RBI and 76 walks (.392/ .496/ .888) to raise average from .146 to .231... From July 22 thru the end of the season (final 63 games) he hit .268 (60-224) with 12 doubles, 13 home runs, 45 RBI and 46 walks (.886 OPS). Carlos batted .260 (63-242, 68 G ) in the second half and was T 6th in home runs (13), T 2nd in RBI (48) and 6th in O P S (.860, min 225P A) in the A.L. after the break ... Hit .308(24-78) in 22 June games with 10 runs, 4 doubles, 6 HR and 15 RBI (1.015 OPS) and followed that up by hitting .313 (30-96) in July with 15 R, 5 2B, 8 HR and 20 RBI in 26 games (1.022 O P S)… Missed 9 games on the 7-day concussion Disabled List from May 26-June 4 for the second time in his career (also 2012). as the club' s Opening Day third baseman, making 26 starts at the hot corner (last coming on May 22) before transitioning to first base in late May...Made 93 starts at first base (94 games) and 22 starts at designated hitter...Also ap p eared in 11 games (10 starts) at catcher, last coming bfeore DL stint on May 25 at Baltimore (foul ball off the mask) ... Compiled a fielding pct of .995 (5E, 911TC) at first base...OPS at first base was .912 (.509 at 3B/ .444 at C) ... Made 130 starts at clean-up , hitting .225 (104-463) with 21 doubles, 22 home runs and 71 RBI (.773 OPS). nj oyed his 4th and 5th career mutli-home run games on July 25 and July 27 (both sides of plate, 2nd time career) at K ansas City, going 9-for-14 in the 4-game series w/5 HR and 8 RBI, tying the club record for HR in series and was named A.L. player of the week for his efforts...Hit .324 (22-68) vs. KC in 2014 w/7 HR and 16 RBI in 17 G (T 2nd for most homers vs. KC in a single-season by an Indian)...Most RBI of any AL opponent vs. KC in 2014...According to Elias his 6HR tied for the most HRs at "The K " in one season by any visiting player (opened in 1973) ... Only other visiting players to hit six homers in a season at K auffman are Jacque Jones in 2002 and Jose Valentin in 2003 ... Hit .268 (70-261) with runners on base...On Sep t. 11 vs. Minnesota he became the 1st Indians player since 1964 (Max Alvis) to hit a homer in both games of a doubleheader sweep , both of which put the team into the lead for good. Had another solid offensive season, spending the last two months of the campaign hitting in the clean-up spot, a move that stabilized the offense...Finished among American League leaders in doubles (T7th, 39), walks (2nd, 93), batting average with men on base (6th, .335, 83-for-248), OPS (15th, .832) and on-base pct. 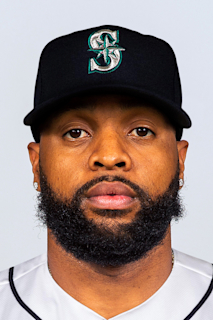 (8th, .377)...Was also among American League leaders in times on base (11th, 242), pitches seen (T7th, 2755) and pitches per plate appearance (3rd, 4.29)...Led the team in extra-base hits, OB/SLG/OPS and doubles...When batting fourth he hit .275 (46-167) with 10 2B, 9HR & 29 RBI in 48 starts in the 4-hole (39BB, .910OPS, see box below right)...Indians were 33-15 (.688) in his starts in the 4-hole...Made 81 starts at catcher (84 games), 47 starts at designated hitter and 24 starts at first base (29 games)...Threw out 10 of 61 runners attempting to steal off him (16.4%) while catching and from August 18-end of season made just 9 starts at catcher (39 team games played)...Reached base in 128 of 154 games he batted in...Got off to a hot starting after hitting .273 (6-22) in the World Baseball Classic with 5 runs scored, 2HR, 3RBI and a WBC-high 9 walks for the WBC Champion Dominican Republic...Hit .389 (28-72) in April with 9 2B, 5HR, 13RBI and 14 runs scored as he led the AL in average, on-base pct (.476) and OPS (1.198) for the month...Went a career-best 5-for-5 with 3 runs scored, 2 doubles, a homer and 3RBI on April 7 at Tampa Bay...Drew a career-high 4 walks on May 23 at Boston...Hit just .200 (20-100) in May with 4 2B, 3HR & 9RBI in 29 games...Enjoyed a 10-game hitting streak from June 8-18, a career-high 12-game hitting streak from Sept. 6-17 and hit an inside-the-park home run on August 31 at Detroit...From Sept 6 thru the end of the season he hit .310 (26-84) with 7 2B, 3HR, 14RBI & 16BB in 23 games (.416OB%/.916OPS)...Hit .365 (72-197) when ahead in the count...Starting in December played in 8 regular season games and the playoffs for Escogido in the Dominican Winter League. Had another solid offensive season, spending most of his assignments behind the dish (95 starts) while making 20 starts at first base and 27 starts at designated hitter...Also appeared in his first career game in the OF on August 12 vs. Boston (LF)...Tied for the team-lead in RBI and led the team in walks/HR, finishing 3rd in the American League with 91 walks and 16th in on-base pct. (.365)...Among primary catchers in the AL, his RBI total ranked 3rd-highest although 29 of his 76 RBI came at DH and first base....Signed a 5-year contract extension thru 2016 with a club option for 2017 on April 10. Season really got going starting in July, as his batting average dipped to as low as .218 as late as July 3rd, his 65th game of the season...From July 1 thru the end of the season hit .278 (79-284) with 16 2B, 13 HR, 47RBI and 49 walks in 80 games (.872OPS), raising his average from .220 to final resting spot of .252...Hit above .276 w/an OPS of at least .803 over each of the last 3 months...Reached via hit or walk in 22 of 24 games in July (.276, 4HR, 12RBI) as his 19BB were T2nd in the AL and his .433OB% was 4th (.972OPS-8th in AL)...In the 2nd half he hit .281 (74-263) with 14 2B, 13HR & 46RBI in 74 games...Was 10th in the AL in second half OPS (.887), 7th in on-base pct (.389) and T11th in 2nd half RBI (46)...Had a then season-high 4RBI on 7/18 at Tampa Bay and homered for first time since May 15 (138 at bats). Was on the MLB 7-day Concussion DL from May 26-June 4 after taking a foul ball off his catcher's mask the night before at Chicago-AL...Appeared in 1 rehab game at Class-A Lake County on June 4...Missed 4 games (right rib cage/mid-back soreness) from June 28-July 1...Enjoyed a pair of 2HR games in 2012 (9/23 at KC; 4/8 vs TOR)...In game of Sept 23 at KC he equaled his single-game career-high in RBI(5)...Drew 15 walks over the last 12 games of the season...From Sept 9 thru end of the season he hit .289 (24-83) w/3 2B, 2 3B, 4HR, 15RBI in 21 games (.90OPS)... Appeared in 20 games for Escogido in the DR Winter League after the season. Threw out 23-of-93 (24.7%) runners attempting to steal off him, the 3rd-best mark among American League catchers...Made 7 errors in 100 games behind the plate for a fielding pct. of .990 (700TC) and tied for AL lead in passed balls (10) with DET CA Alex Avila...Hit .301 (41-136) with 21 RBI in 41 games in the 5th-spot in the batting order (.917OPS) and .236 (70-297) batting 4th (47RBI, 81 games)...Hit .344 (21-61, 18RBI, 21G) while playing first base...Finished T7th in the AL in GIDP (21), 6th in pitches per plate appearance (4.26) and 15th in on-base pct vs. LHP (.388). Had a solid first full season in the Major Leagues, setting a club record for home runs by a switch-hitter (27) and finishing 3rd in the American League with 97 walks...Also finished tied for 18th in home runs (27) and tied for 15th in doubles (32) in the American League, both of which were team-highs...Was also 24th among 73 batting qualifiers with an on-base % of .351...All those totals led the club...Became just the 8th player and first catcher in club history with at least 30 doubles, 25HR and 90 walks...Others: Sizemore, Thornton, Thome, Hafner, Averill, M Ramirez, Belle...Only Sizemore (2008), Belle (1996) and Averill (1934) had at least 35 doubles in those seasons...One of four MLB hitters in 2011 w/at least 25HR, 35 2B, 90 walks (Fielder, M Cabrera, Votto)...Collected his first career two-homer game on September 13 at Texas (3-4, 3RS, 2B, 2HR, 2RBI) and homered from both sides of the plate...It was the 7th time in club history and first by an Indians batter since Victor Martinez on June 1, 2007 vs. Detroit...Hit a walk-off grand slam on April 29 vs. Detroit (Benoit), his first career grand slam...Also the first Indians catcher to ever end a game with a grand slam...Collected second walk-off home run on September 23 vs. Minnesota (Capps), his first career pinch-hit home run and the only PH homer of the season for the Indians...Collected a career-high 5RBI on August 5 at Texas...Split the season between catcher and first base...Made 88 starts at catcher (95 games) and 63 starts at first base (66 games) and made 1 start at DH...Tossed out 21.1% (15 of 71) of the runners attempting to steal off him, 8th best among AL catchers...Started a triple play on April 3 vs. Chicago-AL in his Major League debut at first base...Made 4 errors in 669 total chances at first base (.994 fielding %, would have been 6th best in AL w/enough appearances)...After hitting .230 (66-287) in the first half (.781OPS) Carlos hit .249 (66-265) with 20 2B, 14HR & 38 RBI in 71 second half games (.835OPS)...His 36 extra base hits in the second half were tied for 6th among AL hitters...From August 1 thru the end of the season he hit .254 (52-205) with 16 2B, 12HR & 32 RBI in 55 games (.856OPS)...From September 11th-on he hit .292 (19-65) with 6 2B, 6 HR & 11 RBI in 18 games to end the season...OPS vs. LHP was .964 compared to .732 vs. RHP...Was 8th in the AL in on-base % vs. LHP (.428), 13th in batting average (.318) and 15th in slugging % (.536) vs. LHP...T13th in the AL w/7 int'l walks and 19th w/231 times on base...3rd in AL with 4.30 pitches seen per plate app...Best spot in order was the #5 hole (.306, 11 2B, 8HR, 18RBI, 35 starts)...Was 6 for 13 (.462) with the bases loaded w/15RBI...Highest monthly average was August (.272) followed by May (.263). Had another prolific season as he made his way to the big leagues for the first time, but did not play after August 2ndafter a season-ending injury in Boston...Began the season in AAA Columbus and dominated the International League,earning a spot in the mid-season Triple-A All-Star Game (did not play)....At the time of his June 11 recall from Columbus he was leading Indians minor league players in home runs (13) and RBI(51) and among International League leaders ranked 1st in on-base percentage (.447), walks (45) and OPS (1.044),T2nd in RBI (51), T3rd in home runs (13), 4th in slugging percentage (.597) and total bases (117), 5th in average (.316)and T6th in runs scored (39)....Opened the season with 2 HR & 4RBI on April 8 vs. Indianapolis and had 4HR & 8 RBI over the season's first 4 games...Named IL player of the week during the season's first week...Also hit 2HR /5RBI on May 17 vs. Durham...Overall hehit .303 in April (5HR, 23RBI, 1.043OPS) and .324 in May (33-102, 5HR, 23RBI)...With runners in scoring position(RISP) he batted .390 (23-59) with 3HR and 39RBI and against right-handed pitching he hit .350 (48-137) with 10HRand 41RBI...Hit .237 (14-59) off LHH w/an .811 OPS...Over his last 12 games at Columbus from May 28-June 10 hehit .341 (14-41) with 9 runs scored, 5 doubles, a triple, 3HR and 11RBI...Recalled on June 11 and made Major League debut that night vs. Washington in Progressive Field (0-3, RS, BB)...Became the first Indians hitter since 1977 (Jim Norris, RF) to make his Major League debut hitting 3rd in the lineup...Earned his first Major League hit/RBI w/a second inning double off Washington's JD Martin and hit his first home run,also off Martin, in the 5th inning of that game...Overall with Cleveland he made 40 starts at catcher, 5 at DH, 35 startsin the 3-hole and 10 starts at cleanup....Hit .345 (20-58) in June with 9 2B, 4HR & 15 RBI in 18 games (.1.165OPS) with Cleveland and from July 1st on he hit.207 (19-92) with 4 2B, 2HR & 7 RBI in 28 games but did draw 24 walks over that span for an OB% of .367 (21SO)...Hit .314 (32-102) off RHP and .146 (7-48) off LHP with Cleveland...Overall had a .401 on-base % in 46 games withCleveland, which would have been tied for the 4th best mark in the American League in 2010 with enough at-bats...Didnot start outside the 3-4-5 hole in the batting order the entire season at either level...Threw out 29% (9-31) as Indianspitchers recorded a 4.42 ERA with him behind the plate (340.0IP, 342H, 167ER)....Season ended prematurely after a 7th inning collision at home plate with Boston's Ryan Kalish in Fenway Park on August2nd...Sustained damage to his lateral collateral ligament (LCL) that ended his season and later underwent surgeryto repair the ligament in Cleveland by Dr. Rick Parker on August 6th...Rehabbed the rest of season and off-seasonbetween Cleveland and Arizona and should be ready for the start of the 2011 regular season. Had a monster season, posting arguably the finest offensive season by any minor league player... Batting .326 (151-463) with 39 2B, 5 3B, 21HR, 125 runs & 117 RBI in 130 games...He led all minor leaguers in runs and finished 2nd in RBI, T6th in walks (89), 8th in on-base % (.431) and T9th in extra base hits (65)...Was withClass A Inland Empire of the California League from April 3 until being acquired by the Indians on July 26...Was named California League MVP (and #2 prospect in the Cal League by Baseball America) despite notplaying out west for the final 5 weeks of the minor league season...Was also named a High Class A All-Starby Baseball America and named as having the best strikezone judgment and best defensive catcher in theCalifornia League by BA...Named to the California League mid-season All-Star team...After the season wasnamed the best hitter in all of Class A baseball (High A) by MLB.com and the top prospect in the organizationby Baseball America entering 2009...Added to 40-man roster on Nov 20...Had some monster games and streaks in Inland Empire...Reached safely via hit or walk in 92 of his 99 games,including his first 27 straight and drove in 7 runs on April 12 vs. High Desert... Had 26 multi-RBI games...Went4 for 4 w/4RS, a 3B & 1RBI on June 29 vs. Lancaster...At the time of the July 26th trade he was leading theCalifornia League in RBI (96), on-base percentage (.431) and runs scored (88), was 2nd in doubles (34), 3rdin extra-base hits (52), 4th in slugging percentage (.563) and 6th in batting average (.323)...In the 2nd half ofplay, which began on June 26, he hit .393 (42-107) w/9 2B, 6HR & 30RBI in 28 games (30BB, 20K, 1.167OPS)before the trade...Did not miss a beat in Kinston, reaching base safely in 26 of 29 games and scoring 34 runs in those contests...Hada 10-game hitting streak from July 29-August 8, had a 4 hit game (3-5, 3RS) on August 7 vs. Salem and 4RBIcontest on August 15 at Frederick...OPS actually went up from .993 in Inland Empire to 1.043 in Kinston...Hada .452 on-base & .563 slugging % in Kinston (both marks would have led the league over a full season)...Promoted to AA Akron on August 31 and homered in his first game that day at Erie (1-4, 2RS, HR, 2RBI)...Appearedin only 1 game in the Eastern League playoffs after sustaining an injured abdominal muscle...Completeda healthy stint in the Fall Instructional League without incident...Combined on the year he hit .347 (41-118) off LHP w/2HR & 23 RBI and .319 (110-345) w/19HR & 94RBIoff RHP...Hit .357 (81-227) with runners on for the year and .385 (52-135) with RISP and .353 (18-51) withRISP-2outs. Entered the 2008 season as the 25th best prospect in the Dodgers organization by Baseball America...Spent the year at A Great Lakes in the Midwest League where he was converted to catcher and also spent some time at third base and right field...Hit .207 (46-222) while catching as he adjusted to his new spot on the diamond...Hit.271 (19-70) at the other positions...Hit .299 in July w/7 2B, 5HR & 17 RBI in 21 games. Split the season between Rookie Ogden and A Vero Beach...Season was spent between 3rd base andthe outfield. December 3, 2018 Seattle Mariners traded SS Jean Segura, RHP Juan Nicasio and LHP James Pazos to Philadelphia Phillies for 1B Carlos Santana and SS J.P. Crawford. December 20, 2017 Philadelphia Phillies signed free agent 1B Carlos Santana. November 2, 2017 1B Carlos Santana elected free agency. July 8, 2017 Cleveland Indians activated 1B Carlos Santana from the paternity list. July 5, 2017 Cleveland Indians placed 1B Carlos Santana on the paternity list. May 31, 2015 Cleveland Indians activated 1B Carlos Santana from the paternity list. May 28, 2015 Cleveland Indians placed 1B Carlos Santana on the paternity list. June 6, 2014 Cleveland Indians activated 1B Carlos Santana from the 7-day disabled list. November 25, 2012 3B Carlos Santana assigned to Leones del Escogido. June 5, 2012 Cleveland Indians activated 3B Carlos Santana from the 7-day disabled list. June 4, 2012 sent C Carlos Santana on a rehab assignment to Lake County Captains. November 9, 2010 Cleveland Indians activated C Carlos Santana from the 60-day disabled list. September 23, 2010 Cleveland Indians transferred C Carlos Santana from the 15-day disabled list to the 60-day disabled list. June 11, 2010 Cleveland Indians recalled Carlos Santana from Columbus Clippers. March 19, 2010 Cleveland Indians optioned Carlos Santana to Columbus Clippers. December 2, 2009 Leones del Escogido placed C Carlos Santana on the reserve list. October 19, 2009 Carlos Santana roster status changed by Cleveland Indians. October 16, 2009 C Carlos Santana assigned to Leones del Escogido. July 17, 2009 Carlos Santana roster status changed by Akron Aeros. July 11, 2009 Akron Aeros placed C Carlos Santana on the temporarily inactive list.